The Chess'n Math Association (CMA), the Chess Federation of Canada (CFC) and the World Chess Federation (FIDE) in collaboration with Tourism Kingston, are pleased to invite youth to the 16th Annual North American Youth Championship. This is the 4th time the event is being held in Canada and the first time in beautiful Kingston, Ontario. It will be FIDE, CFC and CMA rated. Everyone who meets the eligibility requirements can play! IM/WIM title, IM/WIM norms, FM/WFM/CM/WCM FIDE titles available! Trophies will be awarded to the top 5 in each section. FIDE Titles as well as norms will be awarded to the top 3 in each section. ELIGIBILITY: Players under 18 years old (as of Jan 1, 2019) from Canada, the U.S.A., Mexico and Bahamas. PLEASE TAKE NOTE THAT ALL PRICES ARE IN CANADIAN DOLLARS. For Americans you can calculate that $100.00 Canadian will cost you about $75.00 U.S.
Queen's University. These are top notch accomodations at University Residence pricing! We have special rates but you must register by June 15, 2019 to take advantage of them. Reserve early as space is limited. or you can call Connie Boisvert at 613-533-6000 ext 75470. Thursday, August 15 at $129 plus taxes. Friday, August 16 at $155 plus taxes. Saturday, August 17 at $155 plus taxes. Sunday, August 18 at $109 plus taxes. Monday, August 19 at $109 plus taxes. Deadline for reservation is July 8, 2019 (limited number of rooms at this rate). Ambassador Hotel is about 6 km (less than 4 miles) from the playing site. PRIZES: Trophies for the top 5 players in each section. All ratings as of August 6th (or as soon as possible thereafter). If a player has a FIDE Standard rating, then that will be used. All other players will be ranked as of their own country's rating. SECTIONS (age as of Jan 1, 2019): Under 8 years old, under 10, under 12, under 14, under 16, and under 18. Open and Girls sections. Sections with less than 10 players may be combined at Tournament Director's discretion. We allow players to play up but they must indicate which section they are playing when they register and no section change can be made after that. TIME CONTROL: Game in 90 minutes plus 30 second increment per move. Valid CFC Membership is required ($32) for Canadian citizens and residents. Quebec players are not required to be CFC members but they must be members of the FQE. This can be purchased at the time of registration. Roster changes (change of section, change of name of qualified player or withdrawal) after July 20, 2019 will be charged $50. Players must purchase a meal package (9 meals) which consists of 5 hot breakfasts and 4 lunches for a total of $120 (includes taxes) or they can opt out, but there is a $45 fee. Sorry folks but the University has made this part of our contract. PARKING: You will be able to purchase a parking pass for $28 which covers the whole event. 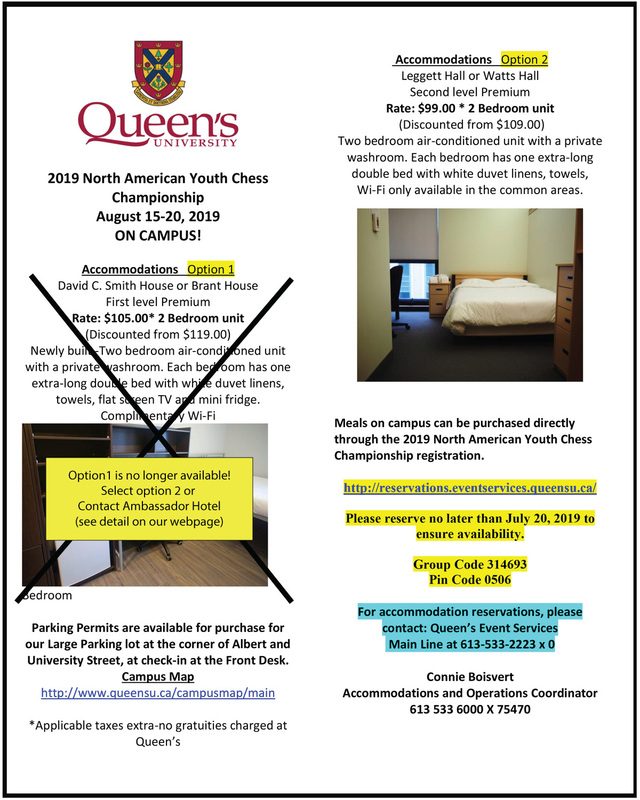 The Chess'n Math Association will cover 60% of the total lodging costs (5 nights at Queen's University) as well as the food package of 9 meals ($120). Other meals are at the expense of the participant.